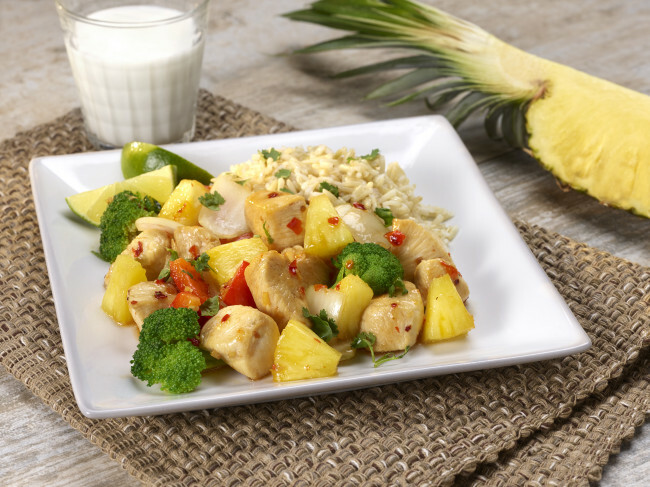 A deliciously sweet and savory dish featuring chicken, fresh pineapple and red bell peppers. Heat 1 Tbsp oil in a large skillet. Add cubed chicken, stir fry 4-5 minutes until chicken is done. Add pineapple; cook an additional 3-4 minutes. Return chicken to skillet and stir in juice from ½ lime, fish sauce, chili sauce and cilantro. Serve over brown rice with lime wedges.